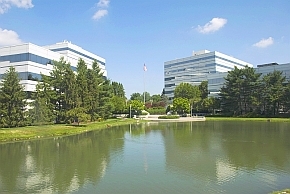 Whitesell recently completed the installation of TPO White Roofing Systems at 6000 and 8000 Midlantic Drive, Mount Laurel, NJ. Thermoplastic Olefin (TPO) membranes are single-ply roof membranes constructed from ethylene propylene rubber. They are designed to combine the durability of rubber with the proven performance of hot-air weldable seams. 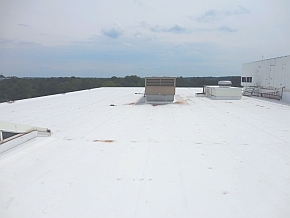 Called “cool roofs” for their ability to reflect the sun’s energy; Thermoplastic Olefin (TPO) roofs coupled with insulation are an ideal commercial roofing system because of their performance, reliability and their ability to significantly reduce the roof’s surface temperature. The white membrane increases indoor comfort and saves on electricity bills by reducing the cost of air conditioning in the northeastern US by as much as $3500 per year. White TPO roofs carry the EnergyStar label for approved energy saving roofing products. The white reflective surface exceeds aide in reducing greenhouse gas emissions and is environmentally friendly in nature because it’s a recyclable product. With the completion of this project Whitesell has installed over one million square feet of this product throughout their inventory of office and industrial buildings. TPO roof atop 8000 Midlantic Dr.